A lot of pilots love aviation gadgets and I am no exception. In spite of being not-quite-the-average pilot, for example. I often fly in sundresses and don't enjoy video games as much as the fella. You can still give me a good pilot app to get me captivated for hours. 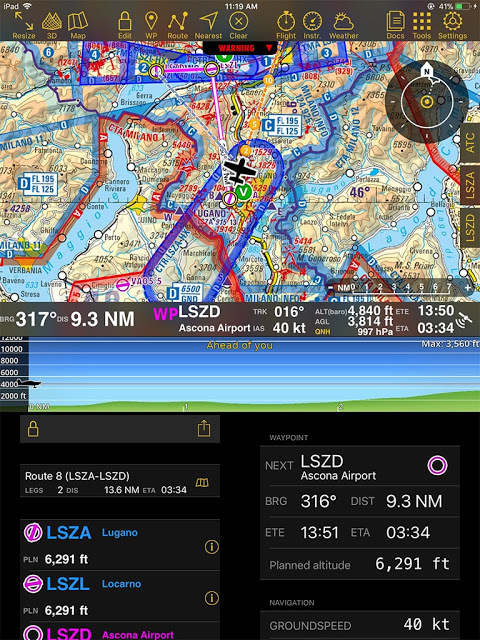 Air Navigation Pro is an exceptional tool for any pilot that blends practicality with a video game kind of fun. 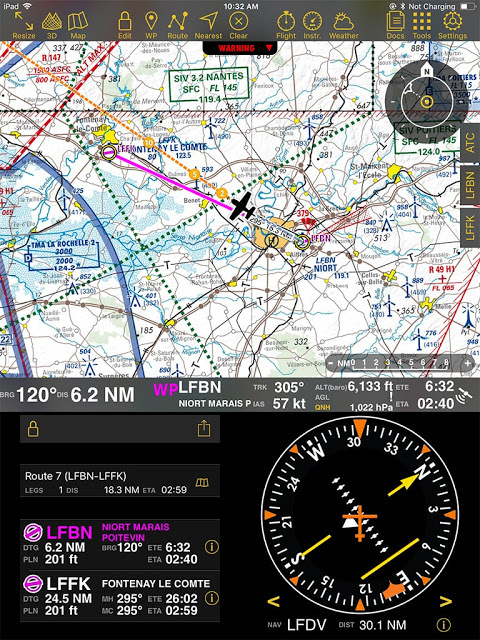 While offering you airborne safety features like traffic alerts and obstacle awareness, it interfaces like an aviation toy-- complete with widgets and a variety of flight instrument displas. Not only is it visually appealing, it is also a useful equipment for your flight. 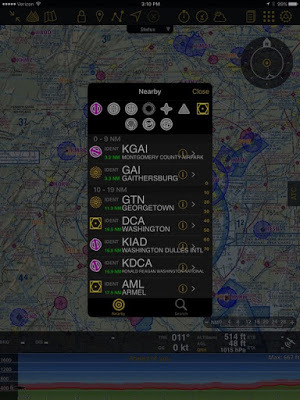 Every awesome app has highlights and features that help aviator navigate safer through the skies. Here are 9 of my favorite features you should explore. Some flights are a breeze (pun intended.) From take-off to landing, you feel like a king. With a perfectly accelerated climb out, pegged altitude and heading, and the softest touch down possible, you walk away from the flight, certain that you are the best pilot in the world. If every flight were this way, you'd still want to use Air Navigation Pro because of its flight recording feature. But you'll really want it for the days that your flight is less than perfect. The Air Navigation Pro Alerts Status advise you of when traffic is near and when obstacles are along your path of flight. This feature eases your mind, allowing your attention to be where it is needed to be in a tough situation, it's programmable to ensure no unnecessary distraction. For example, you can hide all objects that are 1000' or more below your altitude (or 2000' for those mountainous flights). These numbers are in fact modifiable to any proximity you choose, and you can show all of the obstacles if you desire, just another nice touch by the engineers. Setting up the feature is a breeze. You simply just click on the picture of the map and toggle on the features you'd like to active with just a tap. 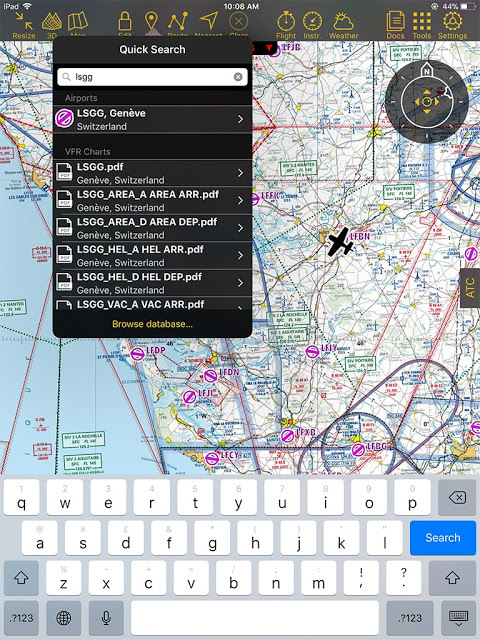 I'd write you a checklist for the process but Air Navigation Pro is so intuitive, any checklist would be short. Build you flight plan on the ground or in the air with the option to add waypoint! Better than any GPS feature I've ever used; waypoint aid allows you to navigate using traditional any point you wish as a waypoint. This feature is especially nice of you're trying to impress a special passenger with an air tour. You can save the romantic view as a waypoint and ensure to impress all future passengers with your route planning as well. Just like alerts, waypoint add is a breeze to set up. Simply click on "Tools" and "Custom Waypoints Editor." Then select "Add New Waypoint" From here, you have the option to quickly select your present position or enter a latitude and longitudinal location. Once added, you're able to save your way point to the database and if you have ANM (Air Navigation Manager) you can seamlessly sync your own waypoint to your group. That's if you'd like to help your fellow aviation colleagues. Another great feature is the satellite view display. Whether you're pre-planning your visual flight route or trying to find your next visual mark, satellite view is a great way to correlate the charts with your present location. To display in satellite view, select the map display and toggle on "satellite photos" at the top. It's that ingenuous. 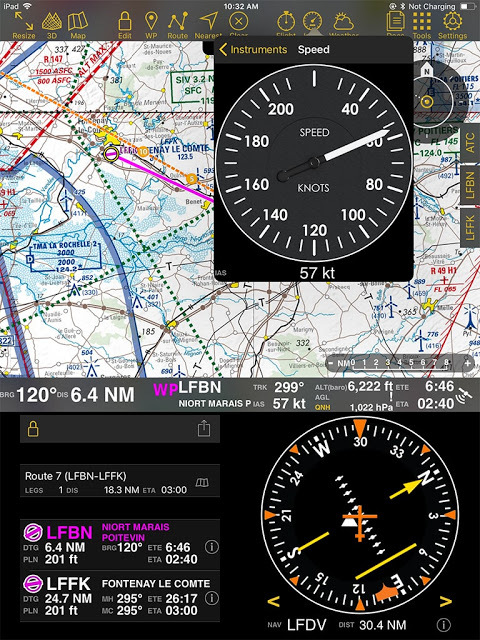 Air Navigation Pro also developed a feature to search for waypoints with the position indicator making it simple to re-plan in flight. Tap on the teardrop with a dot in the middle (often used to identify a GPS location) which pulls up the quick search menu. 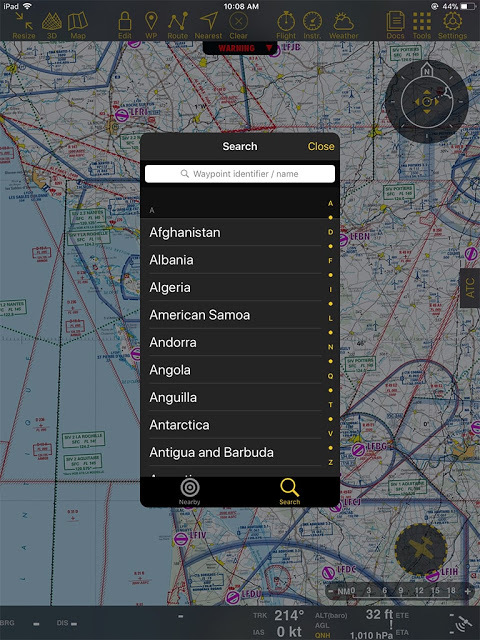 If you already know the name of your destination, simply type it into the quick search bar, tapping on "browse database" will certainly make you one happy pilot. 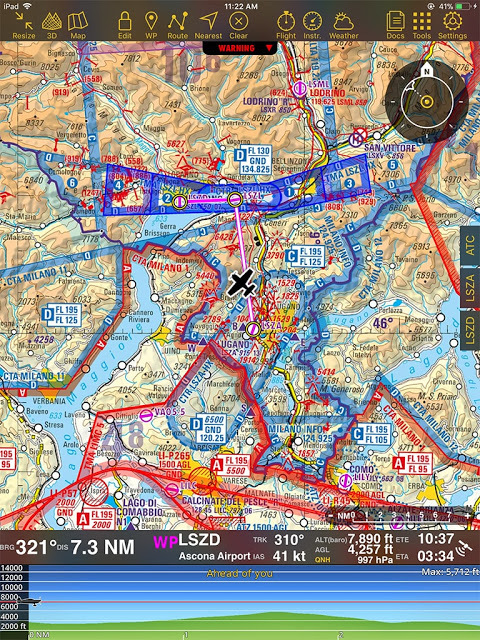 With its list of nearest waypoints, sort options to pinpoint you need from navigational aid, airport, GPS waypoint, and many more, the process of the selecting a waypoint has never been easier. Flight recorder of course made my list of top 9 favorite features. As a Youtuber, blogger, and typical pilot who loves to talk about my flying adventures, flight recorder is an invaluable resource to prove definitively "yes, that did just happen!" Like everything else with Air Navigation Pro, setting up flight recorder is simple! Under "Tools", select Flight Recorder and toggle it on. That's it. Additional uses of flight recorder include the option to playback your route and even link it in for practice in a simulator. Have some fun with your friends, you don't only have to tell them about your flight, but you can also let them experience it. Air Navigation Pro lets your friends relive your flight and even test them and see if they are as successful as you, flying the same pattern. Or if you want to help your buddies out, you can record your next check ride and let them practice ahead of their. How you play, it is up to you. 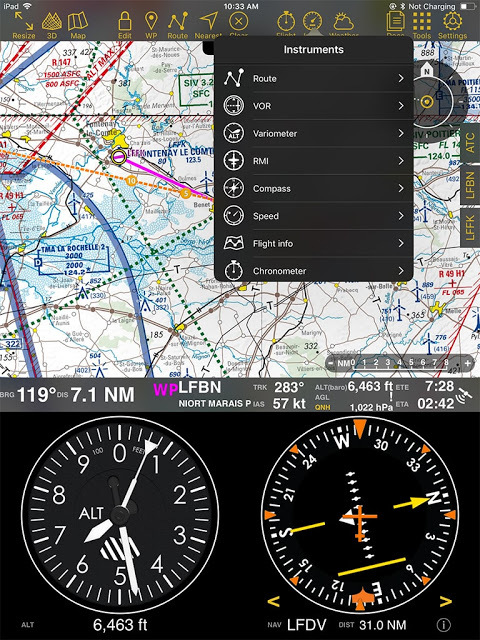 The widgets accessed under the maps options lets you turn on bearing lines, extended track lines, labels on vectors, and runway identifiers. I don't even know where to start in explaining why this is so great. I just wish I had it when I was getting my pilot license. It is frustrating as a student pilot to be at the end of long flight, nearing your destination airport, but unable to visually identify it. While you know you should be setting up for your landing, being unable to see your runway leaves you uncertain of which way to turn. 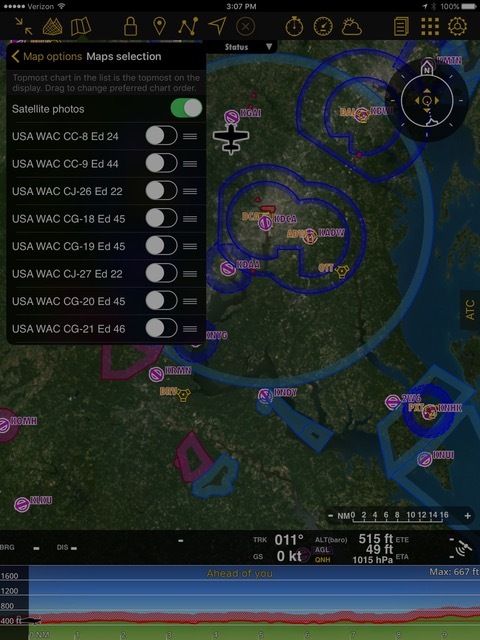 Air Navigation Pro has solved this problem with widgets, it makes everything from identifying the appropriate 45 degree intercept heading to perfectly identifying the runway as simple as it makes everything else. Both located under the Map Option, with a quick click of the toggle you can instantly display your profile above the ground and see the 3D terrain beneath your route of flight. Having previously written a full blog to this feature and why it's so important for safety, I'll keep this recap short. 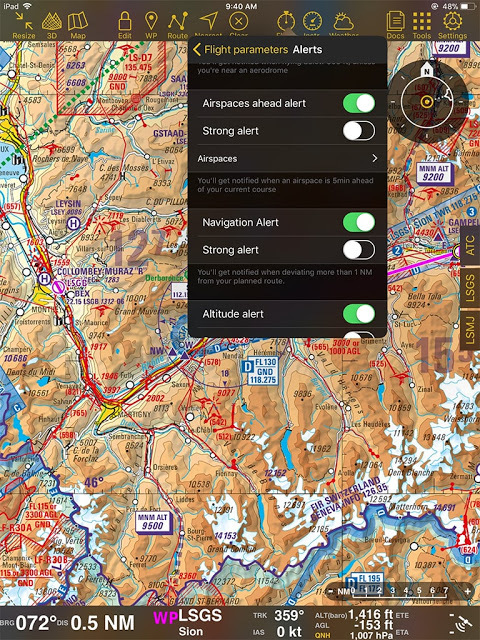 Whether you're building your situational awareness or find yourself in instrument conditions in immediate need of terrain avoidance assistance, this feature is invaluable. I confess, I've found myself more than once playing with the tap on instrument feature as if it were a video game. This tools allows you to select from a list of options including HSI, VOR, and RMI and read the different instruments using actual navigational aids GPS location. I wish I had this when I was in pilot training as it is fantastic in not only aiding in directing you in flight but training you on the ground. To access Tap on Instrument, just select the Instrument icon (the gauge icon, beside the weather icon). 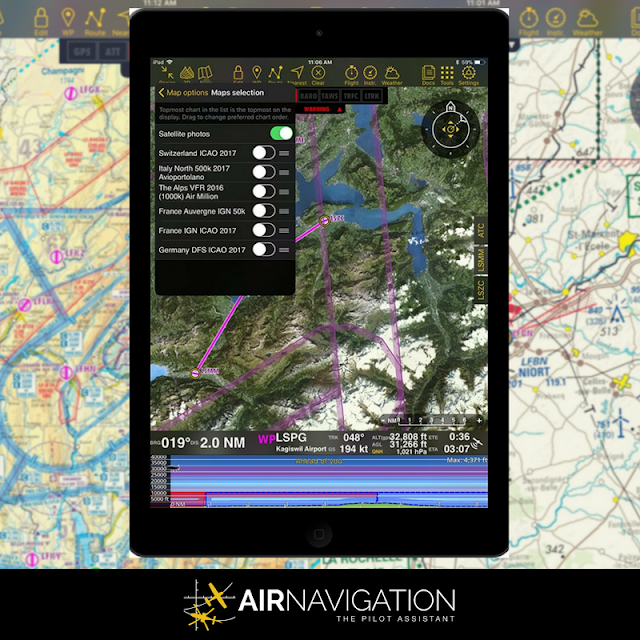 The next time you find yourself waiting in line at the doctor's office or sitting around for your class three flight physical, consider pulling out Air Navigation Pro and using the instruments feature to gain some valuable ground training. You'll advance your piloting skills and I guarantee time will fly by faster than if you were playing Angry Birds.